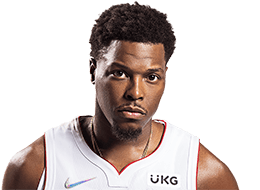 In a 3-point game late in Orlando, Kyle Lowry comes up with a critical offensive rebound for the Raptors. Kawhi Leonard’s jumper falls short, bouncing toward the top of the key. Lowry reads the ball off the rim and steps in to secure the offensive board. Lowry doing the little things in the Game 3 victory for Your Heads Up Play of the Day! Appeared in 79 games (all starts) with the Raptors, averaged career-highs of 17.9 points, 4.7 rebounds and 7.4 assists along with 1.5 steals in 36.2 minutes... Ranked seventh in the NBA in assists (7.4) and tied for eighth in three pointers (190)... Scored 20+ points in 17-of-27 games since the All-Star break - averaging 20.4 points... Made two or more three pointers in 59-of-79 games... Shot .380 (190-for-500) from beyond the arc... Scored 25 points Apr. 11 vs. New York and broke Morris Peterson’s single season team record of 177 three-pointers made set in 2005-06... Missed three games (Apr. 2-5) with a bruised left knee cap... Left the game with 3:12 remaining in the third quarter (sore left knee) Mar. 31 at Miami... Played his 500th game in the NBA Mar. 30 at Orlando... Scored 20+ points in a carer-high eight consecutive games (Mar. 14-26)... Set a career-high for steals in a season (102) Mar. 18 at Atlanta... Earned his fifth career triple-double with 20 points, a career-high 12 rebounds and 11 assists Mar. 9 at Minnesota - 15th triple-double in franchise history. Became the fourth Raptor to record two triple doubles in the same season... Played a career-high 54 minutes Feb. 27 vs. Washington... Set a new career-high for made three pointers in a season (129) Feb. 21 vs. Cleveland... Recorded a double-double in a career-high three straight games (Feb. 10-18)... Named Eastern Conference Player of the Week for games played Jan. 27 – Feb. 2. Led the Raptors to a 3-1 mark, averaging 25.0 points, 8.0 assists and 5.0 rebounds... Averaged 18.3 points, 8.2 assists and 4.7 rebounds in January - only player in the Eastern Conference to average 18+ points and 8+ assists... Recorded consecutive 30-point games for the first time in his career (Jan. 27-29)... Scored a season-high 33 points and recorded 11 assists Jan. 29 vs. Orlando... Recorded his fourth career triple-double with 18 points, 10 rebounds and 13 assists Jan. 22 at Philadelphia... Dished out six-plus assists in a career-high 24 consecutive games (Nov. 13 - Jan. 5)... Scored his 5,000th point in the NBA on Jan. 3 vs. Washington... Finished with 13 points and a season-high 14 assists Jan. 1 vs. Indiana... Averaged 18.3 points, 4.4 rebounds and 8.1 assists during 14 games in December... Scored a then season-high 32 points Dec. 28 vs. New York... Did not return after halftime Nov. 9 vs. Utah due to a sprained right ankle. Playoffs: Finished with 11 points, four rebounds and four assists May 2 in Game 6 at Brooklyn... Matched his career-high with 36 points on 11-of-19 shooting Apr. 30 in Game 5 vs. Brooklyn. Became the sixth Raptor to record 30 points in a playoff game... Recorded 15 points, four assists and shot a perfect 6-for-6 at the free throw line before fouling out Apr. 25 in Game 3 at Brooklyn... Finished with a playoff career-high nine rebounds Apr. 22 in Game 2 vs. Brooklyn... Set playoff career highs for points (22) and assists (8) Apr. 19 in Game 1 vs. Brooklyn. 2012-13: Averaged 11.6 points, 4.7 rebounds, 6.4 assists and 29.7 minutes in 68 contests … Inactive for 12 games … DND for two games … Ranked 18th in the NBA in assists per game (6.4) and 15th in assists-per-turnover ratio (2.77) … Led the team with 101 made three-pointers and 94 steals … Averaged 11.8 points, 5.2 rebounds and 6.5 assists in 51 games as a starter … Recorded 10+ assists 14 times and 10+ rebounds on three occasions … Had 11 double-doubles, including one triple-double … Led the team in assists a team-high 44 times … Scored 20+ points 10 times … Paced the team in assists in 14 of the last 15 games (Mar. 20 - Apr. 17) … Handed out seven or more assists in a career-high six straight games (Mar. 27 - Apr. 5) … Recorded a season-high 13 assists Apr. 3 vs. Washington … Had a team-high 11 assists Mar. 29 at Detroit … Back-to-back double-doubles (Mar. 2-4) for the fourth time in his career … Recorded his third career triple-double Mar. 2 at Milwaukee with 10 points, 10 rebounds and 10 assists … Matched his season high with four three-pointers (all in the first half) Feb. 22 vs. New York … Received his first career ejection in the third quarter against the Knicks … Did not dress due to back spasms Jan. 28 vs. Golden State … Totaled 11 points and a team-high 11 assists Jan. 18 at Philadelphia … Finished with 26 points Jan. 16 vs. Chicago … Scored 19 of his 21 points in the fourth quarter Jan. 15 at Brooklyn after leaving in the second quarter with a sprained ankle … Missed seven games (Dec. 12-26) with a partially torn right triceps; returned to the lineup and registered 17 points and a team-high eight assists Dec. 28 at New Orleans … Left early in the third quarter Dec. 10 at Portland with a right triceps injury … Led the team in assists in four straight games (Dec. 3-9); totaling 31 dimes … Recorded a season-high 34 points with 11 assists Dec. 5 at Sacramento - became the fourth Raptor to record 30+ points and 10+ assists in the same game … Missed six games (Nov. 7-18) with a bruise over the cuboid bone (right foot) … Joined Michael Jordan (1989) and Kevin Garnett (2007) as the only players to start a season with three consecutive games (Oct. 31 - Nov.4) of 20+ points, 5+ rebounds, 5+ assists and 3+ steals … Poured in a then season-high 28 points Nov. 3 at Brooklyn … Led the team with 21 points, eight assists and five steals in his Raptors debut Oct. 31 vs. Indiana. 2011-12: Averaged 14.3 points, 4.5 rebounds, 6.6 assists and 1.55 steals in 47 games (38 starts), in fourth season with Houston ... DND for two games (Jan. 6-7) due to a bruised right foot ... Placed on the inactive list for 11 games (Mar. 10-27) and DND for four games (Mar. 30 - Apr. 6) due to a bacterial infection ... Was a DNP-CD for one game (Apr. 22) ... Also inactive one game (Apr. 26) due to a sports hernia ... Underwent successful surgery May 1 to correct a sports hernia ... Reached 20-plus points 11 times, including two 30-point performances ... Handed out 10 or more assists five times, including at least eight assists in 18 outings (Rockets record: 12-6) ... Had a career- best three 10-plus rebounding games ... Finished with four double-doubles and one triple-double ... Led (or tied) Houston in assists 33 times and topped the Rockets in scoring on 12 occasions ... Returned to action at Sacramento on Apr. 8, coming off the bench to record seven assists; missed the previous 15 contests with a bacterial infection ... Tied career-high 11 boards Mar. 20 at Charlotte ... Had 10 or more points in a season-best 17 straight appearances (Feb. 4 – Mar. 7) ... Totalled 24 points, nine assists, seven boards and a season high-tying four steals vs. Memphis on Feb. 20 ... Topped all scorers with 32 points (9-13 FG, 7-8 3FG, 7-7 FT) and nine assists Feb. 19 vs. Utah, and matched his career high for made 3-pointers ... Set his career best for most free throws made in a game without a miss (9-9 FT) at Memphis on Feb. 14 ... Tied season high with four steals at Golden State on Feb. 12 ... Recorded 24 points and 11 assists Feb. 4 at Minnesota ... Posted his second career triple-double with 16 points, 10 rebounds and 10 assists at Minnesota on Jan. 23 ... Posted a career first with three consecutive 20-point games (22 on Jan. 11 at San Antonio, 25 on Jan. 13 vs. Sacramento and 33 on Jan. 14 vs. Portland) ... Notched a season-high 33 points (13-26 FG, 3-5 3FG), nine assists and eight rebounds vs. Portland on Jan. 14 ... Equalled career high of 11 rebounds Jan. 10 at Charlotte ... Paced the Rockets with 22 points, 10 rebounds and nine assists at the L.A. Lakers on Jan. 3 ... Matched career high with 18 assists Dec. 31 vs. Atlanta ... Recorded four steals at Memphis on Dec. 30 ... Had 20 points (9-10 FT) and 12 assists at Orlando on Dec. 26. 2010-11: Averaged 13.5 points, 6.7 assists, 4.1 rebounds and 1.36 steals in 75 games (career-most 71 starts) ... Was 14th in the NBA in assists per game, tied for 20th in steals per game and was eighth in assists-per-turnover ratio (3.16, 500-158) ... Made a career-high 129 3-pointers after hitting a combined total of 101 treys over his first four seasons ... Became just the third different player in Rockets history to record at least 1,000 points (1,011), dish out 500 or more assists (500) and make 100 3-pointers (129) in the same season ... Recorded a career-best 13 20-point outings, including the first two 30-point games of his career ... Recorded 11 double-digit assist games, 10 double-doubles and one triple-double ... Paced the team in assists on 52 occasions ... DND for three games, Apr. 9-13 with a sore left foot ... Made at least one three-pointer in a career-best 19 straight contests, Feb. 27 – Apr. 6 ... Hit a step-back 17-footer vs. San Antonio on Apr. 1 with 3.9 seconds left to send the contest into overtime ... Tabbed Western Conference Player of the Week for Mar. 14-20, averaging 19.3 points (26-57 FG, 9-20 3FG, 16-17 FT), 7.5 assists, 7.3 rebounds and 1.25 steals in guiding the Rockets to a 4-0 week ... Averaged 19.8 points (94-198 FG, 41-96 3FG), 8.1 assists and 5.3 rebounds in 14 games during March, notching five outings of 10 or more assists and finishing tied for fifth in the NBA in assists per game during the month ... Recorded first triple-double of his career with 28 points (9-14 FG, 7-8 FT), a career high-tying 11 rebounds, 10 assists and three steals vs. Utah on Mar. 20 ... Scored 32 points and tied career high with seven made 3-pointers (7-11 3FG) Mar. 8 at Phoenix ... Topped the Rockets with 24 points and 11 assists at the L.A. Clippers on Mar. 2 after a 21-point, 11-assist effort the night before at Portland ... Posted a career-high 36 points Feb. 16 at Philadelphia making 15-of-18 FGs; hit first 11 shots, including five-for-five from three-point range in the first half ... Was 26-of-55 (.473) from three in December ... Had 17 points and a career-high 18 assists, with five steals vs. Memphis on Dec. 17 ... Recorded 22 points and 12 assists vs. Detroit on Dec. 7, as well as matching his career-high six steals ... Grabbed a career high-tying six steals vs. Phoenix on Nov. 22. 2009-10: Averaged 9.1 points, 3.6 rebounds and 4.5 assists in 68 games ... Reached double-digit scoring 30 times, including two 20-point performances ... Posted three double-digit assist games and two double-doubles ... Houston averaged 15.2 fast- break points in his 68 games played and just 11.6 off the break in the 14 outings he missed ... Stood tied for second in the NBA in charges drawn (51) on the season ... Scored 14 points and dished out a season-high 11 assists at Sacramento on Apr. 12 ... Was on the inactive list for 12 games (Feb. 9 – Mar. 7) due to a left ankle sprain ... Had 14 points vs. Philadelphia on Feb. 6 before leaving with a sprained left ankle ... Made a career-high four blocked shots vs. Oklahoma City on Nov. 6 ... DND for two games (Jan. 31 – Feb. 2 ) with a sprained left knee ... Scored a team high-tying 23 points, with nine assists, six boards and two steals in a 116-109 win Jan. 22 at San Antonio ... Netted a season-high 26 points, dished out 10 assists and nabbed a season-best five steals in a 116-108 OT win at Dallas on Dec. 18 ... Handed out a game-high 10 assists vs. Memphis on Nov. 11. 2007-08: Was one of two Grizzlies to play in all 82 games, averaging 9.6 points, 3.0 rebounds and 3.6 assists ... Averaged 14.1 points, 4.1 assists and 3.8 boards in nine starts ... Ranked third among NBA sophomores in assists (3.6) ... Led Memphis in free throw attempts (348) and was second in free throws made (243) ... Reached 10-plus points in 39 games and 20-plus points four times, including a season-high 24 points at Chicago on Mar. 4 ... Scored in double figures in 12 of the last 14 games, averaging 14.4 points, 3.4 assists and 2.00 steals in 29.2 minutes per game over the final five contests ... Recorded the first career double-double with 13 points and a season-best 10 assists Jan. 25 at Washington ... In first career start, posted 14 points, nine rebounds and nine assists in a career-high 50 minutes at New Orleans on Dec. 7. 2006-07: Appeared in just 10 games as a rookie, averaging 5.6 points, 3.2 assists, 3.1 rebounds and 1.40 steals ... Suffered a fractured left wrist at Cleveland on Nov. 21 that sidelined him for the rest of the season. COLLEGE: In two years at Villanova, averaged 9.5 points, 3.8 rebounds and 3.0 assists as part of a backcourt that also included Randy Foye and Allan Ray ... As a sophomore in 2005-06, selected to the second-team All-Big East, twice made the Big East honour roll, was a first-team All-Big 5 and a Big 5 Player of the Week ... Averaged 11.0 points in his second year at Villanova, ranking third on the team ... Led the club in assists (3.7), steals (2.3) and finished third in rebounding (4.3) ... Named one of 16 finalists for the Cousy Award ... As a freshman in 2004-05, averaged 7.5 points and was named to the Big East All-Rookie Team and Philadelphia Big 5 Rookie of the Year ... Missed first seven games of his freshman year recovering from surgery to repair a torn ACL in his left knee. Wore number 3 last season with the Raptors … Switched to number 7 when Andrea Bargnani was traded to New York … Son of Marie Holloway and has an older brother, Lonnie … Says his mom had the biggest influence on his basketball career … Lists Barry Sanders as his favourite athlete growing up … Enjoys golfing and lists pancakes as his favourite food … Favourite NBA city to visit is Philadelphia, where he was born and raised.